I made these babies up to sell on Etsy.com. Sold one, made a couple more and have never gotten around to putting them on the site. I have to get a better picture of the red lotus. I have it sitting on my glass table and the light comes through it beautifully. I tried the light box thing and wasn’t happy with teh results. I intended this as a stand up piece, so don’t really want to drill screw eyes into the top, but I might just have too. This piece is the first one I used copper patina on. Again, not pleased with the result but that might have been my fault. The patina is all splotchy, so the solder probably wasn’t as clean as it could have been. Ironically enough, the splotchiness works well with the piece, and I really really like it, wnough so that I haven’t put it up on etsy.com yet. More experimentation needed =). I have one more lotus pattern. Same shape, but I am adding a long stem and tilting the flower to the side a bit. Don’t know when I’ll get started on that… I have the Art Walk coming up, so would really like to get a couple pieces done in time for display during that… and a commission piece for christmas. So it looks like my glass card the rest of the year is full. Plus a really good friend has her glorious 40th in November. Going to do a piece for her, but probably not until after the christmas gift is done. Ok. that’s it. Go forth and be arty. is the blue one for sale and if so how much is it? Will you be selling any of the lotus pieces? 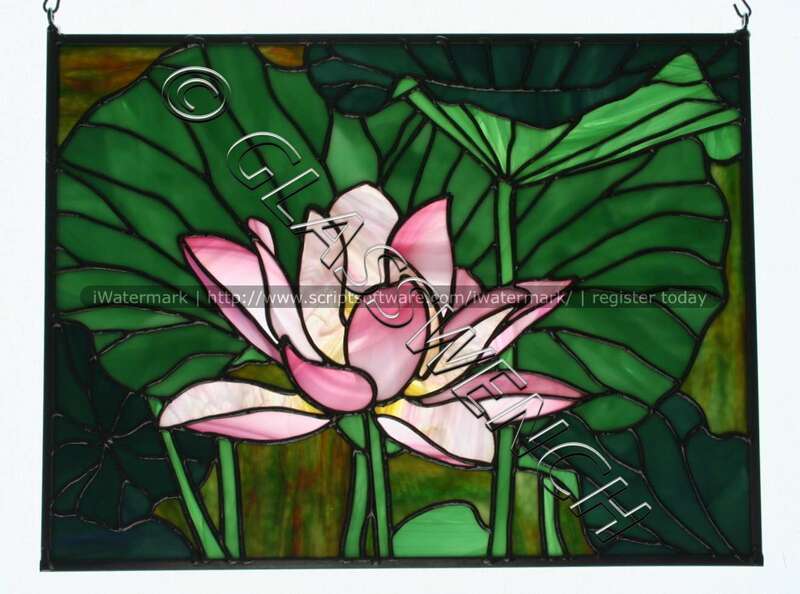 I’m especially interested in the “lori’s lotus” design but your simpler pieces are beautiful as well.